Our first ever bottle shop opens in London today! We've stocked up the shelves and fridges with a huge variety of classic Belgian and German beers, eclectic local London brews and some of the freshest American craft beer this side of the Atlantic. We've also got a growler filling station, so you can grab some draft keg brews to take home too, and we've stocked up on homebrewing ingredients, with plenty of hops, malts and wet yeast for your own crafty capers. Hop on down to check out the biggest and bestest selection of craft beer you can get your paws on! 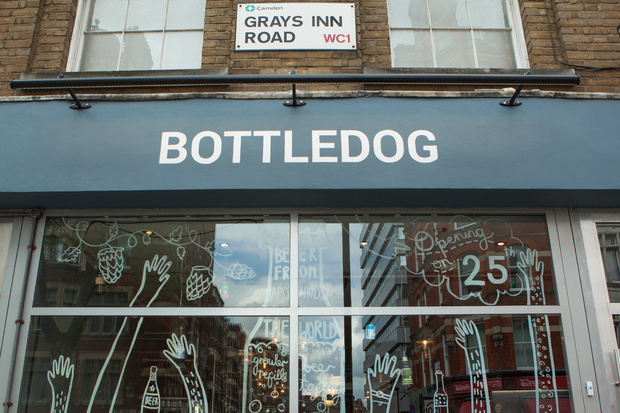 BottleDog is located at 69, Gray's Inn Road, London, WC1X 8TP. Opening hours are Monday - Friday 12noon - 9pm, Saturday 12noon - 8pm and closed on Sunday. Swing by soon to check out our latest hoppy haven!